This is a tasty and simple recipe, simply coat slices of a ripe plantain with masala powder, chili powder and salt and fry in olive oil. I also made some plain ones for Jasmine. I plan to eat this tonight with rice, broccoli, Dal and okra, good veggie meal! Apparently the plantain is a higher nutritional value than a banana, it is high in fiber, potassium, vitamin C, B6 and has moderate protein typical average size plantain fruit after cooking contains 50 – 80grams of carbohydrate, 2 – 3 grams of protein, 4 - 6 grams of fibre and about 0.01 to 0.3grams of fat. On the topic of vitamin C: I just came across this study, so for all you men eat your vitamin C rich produce! looks delightful! love how you incorporate all of the nutrition info. enjoy your dinner. I love the nutritional information! Thanks! Gout is no fun, thanks for the info! I always tell men to watch their protein intake, and their alcohol, but I'd never heard of the vitamin C correlation. Thanks! Ive never tried a plantain before - this recipe sounds yummy! I have onl had plaintains a few times and have enjoyed them. Never knew how nutritionally valuable they are.. thank you. I love these spicy plantains! What a delicious dinner! 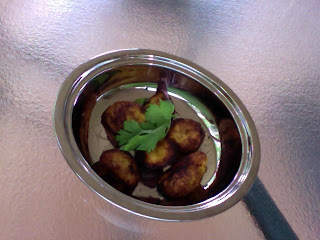 Love plantains and I'm sure the spices give the banana extra boost of flavor! Spicy plantains...nice! I'll make them this way next time- they sound great! FInsmom: they are great esp when going black as sweeter! Donna: tasty and good for ya perfect combo! Yum--looks delicious and good for you too. Love plantains, never had them spicy. Sounds like they were very good. I love plantains, I'll have to try this recipe! Great combo of flavors! wow, that's an awesome idea! I LOVE plantains. Reb-that's an all time fave dish. I have also tried it with garlic,green chillies,salt,pepper and little oil-and then microwaved it on high.Tastes great. This is a seriously great idea. Now I know how good something I love actually is for me. Thanks. You have to look really hard to find them in my neck of the woods, must try harder to get some. I bet this is so tasty! Thanks for the info on men and vitamin C.
yum! We always make plantains and different ways too but I've never had them spicy! Can't wait to try these!